Charity Challenge aims to inspire people to push themselves to their limits, do something amazing and raise as much money as possible for a cause they are passionate about. Over the last 16 years, we have helped raise over £47,000,000 for more than 1,700 incredible causes. Our charity clients include Barnardo’s, the British Heart Foundation, Diabetes UK, Macmillan Cancer Support, Breast Cancer Care, the NSPCC, Comic Relief, UNICEF, Save the Children and hundreds of smaller bodies. Our corporate programmes have engaged the staff, suppliers and customers of firms like Tesco, Boots, Nationwide, Mitsubishi, The Body Shop, Santander, BP, HBOS, Coutts, Schroders, Lloyds TSB, Reuters and Accenture. We are hugely experienced at operating quality challenges to the highest standards of safety and will do all we can to help your organisation recruit and engage participants and supporters. 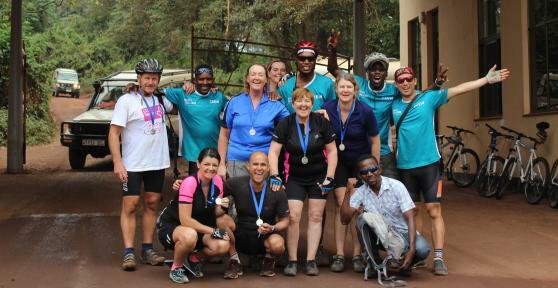 The team - Charity Challenge is managed by a dedicated and experienced team of former participants, fundraisers, tour leaders, charity executives and tour operators. We have all trained hard and fundraised like crazy for awe-inspiring challenges. We genuinely understand what our participants go through and do our utmost to ensure an amazing experience. Continuous improvement - We continuously invest all our energy, enthusiasm, time and resources into developing and improving the challenges that we operate – both on the ground in-country and behind the scenes here in the UK. Our aim is to constantly work towards improving the administration and range of services for our clients. Safety - Our Challenge Safe initiative stresses the vital importance of health and safety on our challenges. It impacts on everything we do to reduce the risk of injury, illness or death and is an investment which, over time, will ensure that we continue to raise the standard of safety for our groups and subsequently the quality of our challenges. Open challenges - We have a huge range of OPEN CHALLENGES worldwide, which means anyone can participate and raise funds for any UK-registered charity. Even if you have just one interested supporter, that is enough to take on a challenge in aid of your cause. We take the bookings, do all the challenge admin and provide a huge amount of support materials (including: sponsorship forms, fundraising ideas, fitness training notes, challenge information and more). All you have to do is promote the opportunity, authorise the participant to fundraise for your cause, collect the sponsorship and help with any queries about the charity’s work. To make it even easier, we provide a free range of charity-branded resources to help you promote the challenges (images, videos, web pages and information sheets). On average, the charity raises approx. £3100 (£1,500 net) per participant (based on the minimum sponsorship option). Exclusive challenges - An EXCLUSIVE CHALLENGE is where we agree, in advance, a specific challenge on a specific date that will benefit your charity exclusively. Anyone who signs up must raise funds for your cause. We will advertise the challenge on our website and through our social media channels, but the main emphasis on recruitment comes from your supporter network. In order to book an exclusive challenge, you need to aim for a minimum number of participants (ideally 20-30 people). If you reach minimum numbers, we will operate the challenge exclusively for your cause. An agreed group size will be set out in advance and once this is achieved, Charity Challenge will provide a free of charge place for a charity rep to join the challenge. With our help, the challenge can be tailored to a variety of audiences, including corporates and major donor groups. Corporate groups - Corporates recognise the value of taking people out of their comfort zones and working together to achieve a goal. As such, our corporate challenges have been used in a variety of ways: as part of graduate recruitment and retention programmes, incentive and reward schemes, classic teambuilding, senior management team bonding, supplier engagement and more. We can organise private group departures for companies in the UK, as well as further afield. 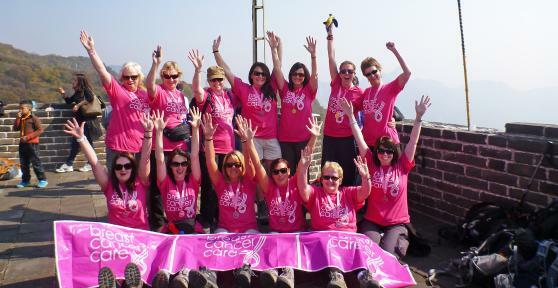 Our classic challenges include treks, bike rides and mountain climbs. 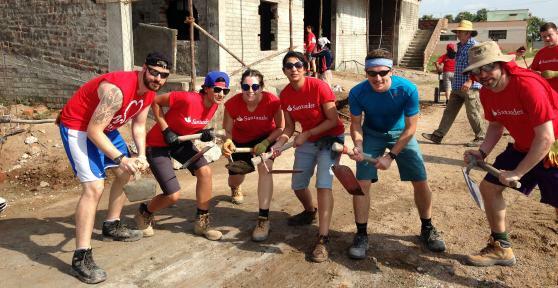 Our extensive community challenge programme also addresses HR and CSR needs by providing an incredible team-building challenge in a developing community, building vital infrastructure such as houses, schools and medical centres. If you are looking for employee engagement opportunities, please get in touch to discuss the concept in more detail. Private groups - A growing number of our challenges are exclusively run for private groups. These include: corporate groups supporting their charity of the year, sports and social clubs, groups of friends celebrating a big birthday or colleagues who simply want to participate on the same challenge. If you have the enthusiasm, the contacts and the desire to make a change, we can organise an exclusive departure date for your private group. We will handle all of the administration and deal with queries about the challenge. All you need do is inspire as many adventurers as possible to join you on the trip. If your group is smaller than the minimum size required, you can book onto an open challenge and make up a large part of the overall group. To find out more about organising a private group, please give us a call. We are committed to helping you get the most out of your challenge. We’ll help you review the various challenge options, what might work for your target audience, how to structure the funding models, how to market the challenges and what messaging to use. We’ll also support you with branded materials to help with marketing and recruitment, and an account manager to help you deliver the recruitment strategy. Once registered with Charity Challenge, you’ll gain access to a personalised members’ area with a massive range of free resources and information (whether you wish to promote open or exclusive challenges). The resources include detailed notes on how the administration works, the funding models, the insurance, the health and safety measures, the legal aspects of running a Charity Challenge and whatever else we can do to support your fundraisers. When a supporter asks for more information about any of our challenges, all you need do is complete the contact form in your charity members’ area. This saves the inconvenience of finding the right itinerary on our website and printing off sheets of paper to post out. The enquiry response system will automatically send the supporter a colourful e-newsletter, with a full range of supporting information including an itinerary, kit list, fact file, Q&A sheet, map, image slide show and booking form. The supporter can even book online via the email. The email looks as if it has been written and generated by you. You will even be able to personalise each email with your charity's standard welcome and sign off. Meanwhile, responses from the enquirer will go directly to you. Our involvement only begins once a booking is made. All this is managed through the charity members’ area. We have designed a poster template which you can automatically personalise with your charity name, logo and contact details. Once you have entered the relevant details you wish to appear in the poster design, you will be able to view it, save it, print it or email it to your supporters asking for them to display it at their work/sports centre /library or wherever. We have a range of colour designs and you can either create one for a specific challenge or a generic one covering all events. The poster design can be adapted for any of our challenges, so you can target specific audiences with events that you think will suit them. If a picture says a thousand words, imagine the message you can put across with some great video footage! We are delighted to be able to provide you with access to a large selection of high resolution copyright-free images for each of the challenges that we operate. We also have a huge range of promotional videos for the challenges that you can use to inspire, motivate and recruit supporters on to a particular challenge. You can also personalise videos with a top and tail logo, as well as a call to action. If we run your challenge, we can also film it and create a powerful and personalised charity video to use for future promotional material. You will be able to download them for free and use them to help with your marketing activity, newsletters and charity publications. You can now promote as many of our open challenges as you wish on your website, as if you were promoting your very own exclusive challenge. Simply select the challenge you want to promote and the departure date within your charity members’ area. Our system will provide you with a unique URL to that particular challenge and date for your charity, all appropriately branded with your logo, registered charity number and selected colour theme. When your supporter books a place on the challenge through this unique web page, they will go through to a charity-branded booking page. This eliminates the potential for them to see any other charity during the entire process. Please click here to see an example of what your page could look like if you decide to promote one departure date. Please login to your charity account area with your username and password. Here you can access the wide range of charity branded marketing resources and support information. If you don’t have a username, please look up the charity and ask the key contact listed to add you as a user. We will then create new user account for you. If your charity is not listed, please click on REGISTER YOUR CHARITY below. If you have any questions, please do not hesitate to get in touch with us. CSR - Charity Challenge provides you with a means to action your company’s corporate social responsibility policy, while developing your greatest asset – your people. A team of highly motivated and engaged employees can raise a huge amount of awareness with personal stories, photos and case studies. Using their first hand experiences, they become powerful advocates for your company and the cause in question. Participants return to work wanting to share their incredible experiences with other staff, clients and customers, about how the company’s involvement has made a real difference. For a more tangible impact, our community challenges help to build schools, health centres and houses in developing communities, for those in desperate need of the basic facilities that most of us take for granted. It's an awesome process to be a part of, and incredibly engaging and inspiring. HR - The remote communities where we operate provide an incredibly stimulating, real and memorable learning environment, in contrast to traditional office-based HR courses. The challenges act as unparalleled bonding experiences for clients, customers, partners and suppliers. Strong team relationships form, due to the common goals and emotional experiences. Challenges improve personal relationships by breaking down barriers, improving trust, respect and flexibility. Participants talk of "feeling more motivated" and of "having respect for their employer." Your company’s involvement makes it attractive in terms of recruitment, retention and investment. Participants return knowing they have helped a good cause and gained new skills (which are relevant to the workplace) and have a deeper understanding of the importance of different individuals within the organisation. PR - The challenges provide an incredibly powerful opportunity – internally and externally – to communicate how you are executing the company’s mission and values. Engaging your people to get fit, push themselves to their limits and raise money for a great cause creates highly motivated ambassadors for the charitable organisations and your company’s support of them. Returning immensely enthused, your staff will filter back their experiences to their colleagues and departments. Some of these stories may be so powerful, that they could be communicated to a wider audience through companywide presentations and films, online diaries and blogs, exhibitions in reception HQs and articles for in-house magazines and intranets. These passionate testimonials are a great and authentic way to enhance your reputation. You - Operating in such motivating environments, the challenges provide both a physical and emotional long-lasting experience. "I just wanted to extend my thanks and appreciation to all the staff at Charity Challenge for giving me what was the most amazing week I have ever experienced. I feel as though I have crammed a whole year's experience into seven incredible days." "On a physical level, I left Africa with the satisfying knowledge that I’ve made a positive impact on somebody's life. On an emotional level, I feel as though I have bonded with the team and the community to the degree where I have both gained and lost a family in a week." "I feel that I’ve been shown some incredible things - such as hope and inspiration. Your commitment and enthusiasm for making the world a safer and happier place for people who are complete strangers, is both inspiring and humbling." We aim to set responsible tourism standards, to minimise the impact of our challenges on the environment within which we operate and, above all, to ensure local people benefit from tourism. 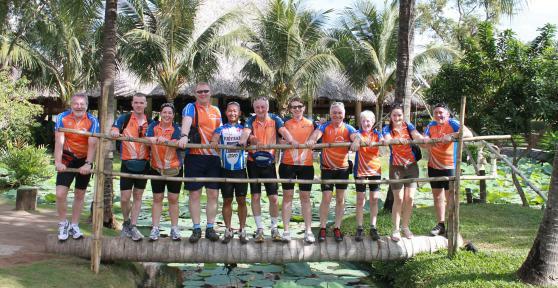 As well as employing local guides, porters and support staff and using locally-owned accommodation where possible, Charity Challenge supports projects and charities which operate in the countries we visit. Since our very first challenge, we have donated almost £500K to charities and projects in the UK and overseas. We have also offset over 13,100 tonnes of carbon emissions with ClimateCare. To view our responsible tourism policy click here.